The Civil War period foot artillery sword is among the more unusual edge weapons in use during the period. The extent to which it was carried in the field is uncertain and it does not commonly appear in photographs taken in the field. However, it was a regulation item and a significant number of them were manufactured and available for issue to troops. Certainly, a colonel of a heavy artillery regiment, garrisoning a fort, would like to see his men well turned out on dress parade and no doubt these were worn by troops. 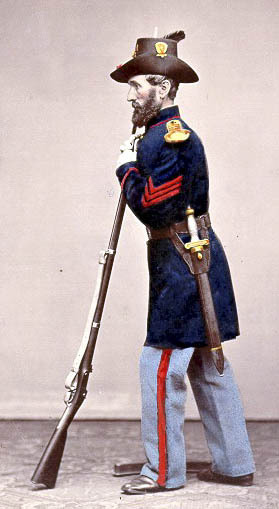 The above colorized photograph was taken in 1866 by the Quartermaster Department to photo-document the regulation dress uniform of the U.S. Army. This would be how a soldier might appear on dress parade but is not how he would ordinarily be attired. It is likely, foot artillery swords were more ornaments than a practical weapons or tools. The design was borrowed from the French and based on the Roman short sword, known as a Gladius. They were adopted in 1832 and remained in use until 1872. 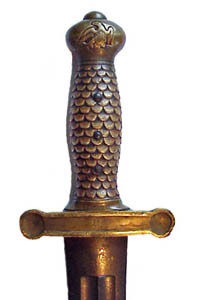 The hilt is made of brass and a U.S. eagle appears on the pommel. The blade is straight, made of steel and is 19 inches long. The manufacturer's name in the above example, appears as a marking AMES MFG CO/ CHICOPEE/ MASS on the top of the blade and on the other side is the inspector's initials, A.D.K (A. D. King), and US, but unlike many other swords there is no year on this particular specimen but some others are dated. The firm founded by Nathan Peabody Ames (1803-1847) of Chicopee, Massachusetts was the sole U.S. Army manufacturer of these and provided about 16, 200 of them between 1832 and 1862. Of interest is that his 1832 contact to manufacture the foot artillery sword was the first of many that he made with the U.S. government. The final production run by the Ames firm was in 1862 and afterwards the ordnance department issued those requested from its existing stocks. From 1832 until 1840 this sword was also issued to sergeants and musicians of infantry regiments, but was supplanted by the Model-1840 NCO and Model-1840 musician's sword, once they were adopted.